Inadvertent administration (“syringe swapping”) of anesthetic drugs can be a cause of morbidity and mortality.1,2 In addition to the basic but essential need to read medication labels, a color coding system of common anesthetic drug classes to decrease medication errors was established by the American Society for Testing and Materials International (ASTM International) and the International Organization for Standardization (ISO).3 Most of us should be familiar with the standard colors, e.g., light blue for narcotics, red for muscle relaxants, grey for local anesthetics, and so forth. Recently we discovered a supply of drug labels in our holding room area that did not follow the ASTM color guidelines. 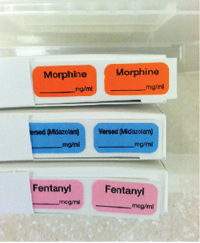 The label for morphine was the same color as the ASTM guideline for benzodiazepines, the midazolam label was the same blue color reserved for narcotics, and the label for fentanyl was pink. It turns out that someone in the pharmacy who was not familiar with anesthetic drug label standards ordered these labels for the holding room. The labels were pulled, and replaced with labels of standard color recommendations. While label color should not be used in lieu of label reading, undoubtedly anesthesia practitioners rely on color of labels, vaporizers, and so forth to a great degree—perhaps more than we should.4 But certainly the use of nonstandard label colors is a recipe for disaster. Anesthesia providers should be active in scouting their work environment for such items, and discard them immediately when found. Eichhorn JH. Syringe swaps in OR still harming patients. APSF Newsletter 2008:23:57-9. Fasting S, Gisvold S. Adverse drug errors in anesthesia, and the impact of coloured syringe labels. Can J Anaesth 2000;47:1060-7. Rose G, Eichhorn J, Dilorenzo A. Implications of a mislabeled vaporizer and the importance of color coding. APSF Newsletter 2008:23:60-66.